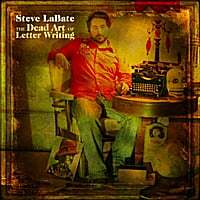 Steve LaBate-The Dead Art of Letter Writing. Atlantan Steve LaBate is an interesting guy. He's a writer/editor for Paste Magazine, and is best known musically as "Christie Brinkley" in the punk-comedy band Attractive Eighties Women. He goes solo here, and it's apparent his real idol is Paul Westerberg as The Dead Art of Letter Writing might be the best Replacements record to come down the pike since Pleased to Meet Me. 'Mats fans will immediately identify with this record from the opening guitar riff of "Reckless Hearts", which comes right out of Westerberg's "Knockin' on Mine". There's also a Stones influence evident, as well as early Wilco ("Wind-Up Toy" is a cousin to tracks like "Outta Site Outta Mind" and "Monday"). Other standouts include the midtempo "Channel Surfer", the raucous, Clash-like "Cops in Alley", and the "Rocks Off" rock of "Ratskellar". This is power pop/rock 'n' roll for true believers, and LaBate speaks the truth. The Genuine Fakes-The Genuine Fakes. The Fakes have been billed as Sweden's Fountains of Wayne, and they do share that American band's brand of effervescent power pop if not their oh-so-clever lyrics and character studies. On their Kool Kat debut (also known as "The Striped Album") they do open things with a FoW touch, a self-titled track which serves as sort of a theme song for the band. From there on out, it's one well-constructed power pop track after another, complete with hooks and melodies galore. The standouts here are "The Promise", "Something New" and "If You Then I", but all of the tracks are of a uniform high quality. The only drawback is that there is a bit of sameness from track to track (even the cover of Beyonce's "Irreplaceable" is done in their frenetic power pop fashion), making them the perfect band to put in shuffle mode with your other favorites. As always, Kool Kat is offering up an exclusive bonus disc with the regular disc purchase, so make sure you stop there for a copy.